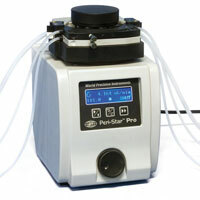 A peristaltic pump has a series of rollers that rotate around the edge of the pump head. A flexible tubing is threaded around the rollers and pressed up tight next to them, pinching the tubing where it contacts a roller. As the rollers rotate around the head, the fluid in the tubing moves from the input to the output. The rate of head rotation and the size of the tubing determine the volume of fluid that can be pumped. The volume that can be pumped is limited only by the volume of the input source.